Working in the healthcare profession can be a rewarding career for many. However, it is a physically demanding job and can be dangerous. This can result in healthcare workers suffering serious injuries in workplace accidents that prevent them from working while they recover. They may have to prove their employer’s negligence in order to receive compensation for their injuries if they work for a non-subscriber employer in Texas who has opted out of providing workers’ compensation benefits. Musculoskeletal disorders (MSDs) are injuries to a person’s muscles, joints, and tendons caused by lifting people or objects that are too heavy. These injuries can affect any muscle or joint, but the most common injuries healthcare workers suffer are to their shoulders and back. This type of injury can cause recurring pain, joint stiffness, and swelling, which can limit a person’s ability to work and perform some day-to-day activities. There are many slip and fall hazards in healthcare settings—such as spills of food and drink, slippery floors from cleaning, and tripping hazards—when employers fail to maintain a safe work environment. Employees who are often moving quickly due to the fast pace of their jobs can suffer serious fractures to their leg, foot, arm, hand, pelvis, hip, and more in a fall. In addition, these injuries can be caused by a violent attack, which is sadly a risk in these jobs. Back injuries are common in the healthcare industry due to the awkward positions and heavy lifting on a daily basis required by these jobs. Individuals can suffer a herniated disk, which is damage to the jelly-like cushions between the vertebrae in the spine, that can cause arm or leg pain, numbness in the body part affected, and muscle weakness. This can make it impossible for them to work until they recover. Paramedics can suffer serious burns when they are rescuing patients from emergencies, such as fires. 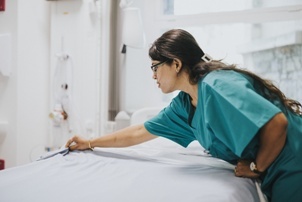 People who work in healthcare settings are exposed to mucus, body waste, airborne pathogens, and bloodborne diseases through the use of needles. As a result, they can develop serious infections or life-altering illnesses, such as HIV or Hepatitis B or C when their employer fails to implement proper safety measures. If a healthcare professional is injured in a slip and fall accident or is the victim of violence, he can suffer a serious head injury that can cause permanent brain damage. Traumatic brain injury is a common injury caused by a fall that can result in long-term changes to a person’s vision, mobility, reasoning, memory, and concentration that can make it impossible for him to return to work and, in some cases, care for his daily needs. If you work for a non-subscriber healthcare employer in the Dallas/Fort Worth area, our experienced workplace accident attorneys are here to help you prove that your employer’s negligence caused your injuries and fight for the compensation you deserve. Contact us online or call our office directly at 817.380.4888 to schedule your free consultation today.